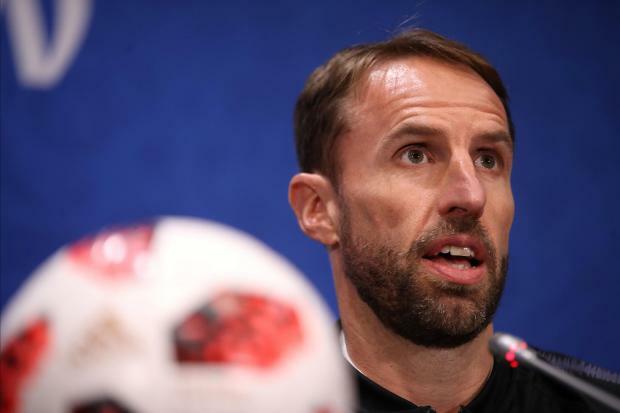 England manager Gareth Southgate hopes to steer England into the World Cup final. It's the unmistakeable refrain being sung, hummed and whistled wherever English football fans have gathered for the last couple of weeks, but for two decades "Three Lions" was the source of nothing but pain for England manager Gareth Southgate. The infectious song, with its chorus "It's coming home, it's coming home, it's coming, football's coming home", was written by pop star Ian Broadie and comedians David Baddiel and Frank Skinner ahead of England's hosting of Euro 96. In the last four they met their 1990 World Cup semi-final nemesis Germany, who gatecrashed the hosts' party by winning a penalty shootout after England's sixth spot-kick - taken by Southgate - was saved. It was a miss that at one stage threatened to define Southgate's career, and the song now being sung so joyously once again around England served only as a reminder. "Football's Coming Home is a song I couldn't even listen to for 20 years, frankly. So for me it has a slightly different feel," Southgate told reporters on Tuesday, before adding: "But it's nice to hear people are listening to it again." The 2018 side are guaranteed to join that pantheon whatever the result of Wednesday's semi-final against Croatia in Moscow, though, and Southgate said there were some similarities. "The feel of this group of players is very similar to the players we had then, but that team was a lot more experienced in terms of age and experience of big matches," Southgate recalled. "It had tactical understanding, it had technically good players. We have emerging leaders, that team had six captains at their clubs. "But we approached this tournament in the same way. We were a group of guys having a lot of fun, enjoying our football, learning and improving all the time - and that's what these lads have done."